Gurmeet & Debina Are The 'Winning At Twinning' Kinda Couple And Here's Proof! You may have been seeing a lot of Gurmeet Choudhary lately promoting his third Bollywood film, Paltan. Before getting into the industry with movies like Khamoshiyan and Wajah Tum Ho, Gurmeet was one of the most popular TV stars. His brooding looks and sharp sense of style was the reason why I liked watching Geet on Star One so much! He started his career on television with the NDTV Imagine show, Ramayan, as Lord Ram and interestingly enough, married the actress who played Sita, Debina Bonnerjee. In a recent picture of the two out on a date, we noticed how the couple not only looked their stylish best but were also colour coordinated. Debina wore a chic short-suit in powder blue with a simple grey cami top inside and matching booties to complete the look. On the other hand, Gurmeet too was seen in shades of blue and matched his watch to his boots. His choice of accessories - round gradient tint sunglasses. 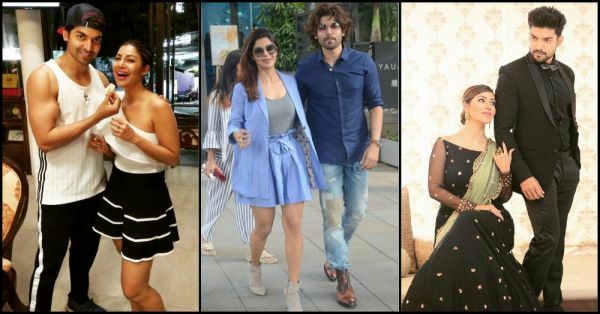 Their fashionable outfits prompted us to stalk the TV couple a bit and we found out that they are all about twinning! Whether they're going to Haji Ali, an event or on vacation, Gurmeet and Debina are always, always, winning at twinning. Here's proof. A couple who twins together stays together. Gurmeet and Debina are the best examples of this theory. Don't you think?